First of all, I just want to give you a very sincere thank you for submitting your Shepard! Without you, this site would have about 5 Shepards and would be lonely and embarassing. And, you'll never hear from them but know that you're helping tens of thousands of other gamers, and they thank you as well. Please read the information below before sending in your Shepard, especially the part about what goes in the big text box. Your submission will not be posted without the text box filled out correctly. The link to submit is at the bottom of the page. We are looking for saves that have completed the endgame. There's no special save like there was at the end of ME1 with the "Char" file. So, before you submit a save, please make sure you have a save where you're back on the Normandy AFTER going to the Collecter Base in the Omega 4 Relay. We are also hoping for saves that have completed as much of the DLC and N7 missions as possible at this point, but even if you didn't finish all of it, please feel free to submit. The only requirement is a save that has finished the Omega 4 Relay. The saves can be found in your My Documents --> Bioware --> Mass Effect 2 --> Save folder. Your Shepard WILL NOT be posted unless all fields INCLUDING the questions in the text field are all filled out. I really appreciate anyone taking the time to send in their save, but if your description left out a bunch of information, is done in all caps or otherwise difficult to read or edit, your Shepard may not be posted. If you do not fill out the text field at all, your submission will be deleted. Please note that your Shepard will need to be manually approved by me before he or she shows up on the website. I completely read though each save before approving it. Uploading "joke" characters does nothing but make me delete it before anyone sees it. The save files are also checked. If you are submitting an updated version of a save already submitted to the site, it'd be easiest for both of us if you find the old version of your save on the site, then submit an entirelly new save with the updated file. Copy/paste your old data from the previous submission, add in the answers to the new questions about DLC, then at the end of the text box field link to your old save and put a note saying this is an updated version of the old save. I'll delete the old version and edit out your notes about it at the bottom. Thanks! Please note that all of these should be answered as the character in ME2, not as they were in ME1 if this is an import. NAME- Please type in the first name of your Shepard. Please do not type "Shepard", that will auto-populate. ALIGNMENT- "Mixed" refers to if you feel like were fairly balanced between Paragon and Renegade choices on quests, inturrupts, and dialogue choices. If you used a cheat or bug to max both bars, but still made choices generally on one side, please pick that instead of Mixed. ROMANCE- Please choose which romance option you persued. If you were faithful to your ME1 romance, please pick them. You will know you were faithful if you got the "Picture Gazing" scene after passing through the Omega 4 Relay and their picture remains face up (It will look something like this). If a squadmate came to your cabin after passing through the Omega 4 Relay, please choose them here, even if you chose not to consumate the relationship. If you broke up with a romance and picked another after the Omega 4 Relay, please pick whichever one you're in a romance with at the time of the save you're submitting. Please fill out any further information about your Shepard's romantic escapades that you think might be important in the text box. SURVIVING COMPANIONS- Please put a check mark next to all surviving members of the party at the end of the game. Note: If you brought Morinth instead of Samara, please check (or not) Samara and note in the text box that you had Morinth. COLLECTOR BASE- Please choose whether you destroyed the collector base or gave it to Cerberus at the end of the Omega 4 Relay. CONTACT (email)- This field is optional, however if you would like me to be able to contact you after entering your save for any reason, please leave an email address. Your email address will NOT be displayed with your save and I promise to never use your email address for anything outside of contacting you about your save, if necessary. SAVE FILE- Please upload your save file as described above. The saves can be found in your My Documents --> Bioware --> Mass Effect 2 --> Save folder. TEXT BOX - The text box is the huge white box on the submission form. Please answer the questions below in the text box. Feel free to put in as much additional information about your playthrough as you wish! Your Shepard cannot be posted without the information requested below. PLEASE DO NOT LEAVE THE QUESTIONS IN YOUR SUBMISSION -- Just answer each question in short, concise phrases like all the saves on the site (click for examples). What I'm saying is, please make your submission look like something like this and not like this. Thank you! Leaving the text box blank or without the requested information will result in your submission being deleted. If I have to do a lot of editing, it will result in significant delays. - If you did not import a ME1 save for this ME2 game, please indicate that first, but still answer the rest of the questions below. - Who, if anyone, did you romance in ME1? - If you romanced someone in ME2 that you "cheated on" in ME2, please indicate here, or indicate if you were "faithful"
- Is Kaidan or Ashley still alive? - Is the Council the original Council from ME1 or the Human-council? - Is Anderson or Udina on the Council? - Feel free to add more information about your ME1 import if you'd like. - Did you complete both of Liara's quests in Illum pre-Shadow Broker? - Was the Rachini Queen's Asarai spokeswoman present on Illium (ie are the Rachini still alive)? - Did you do some, all or none of the N7 missions? 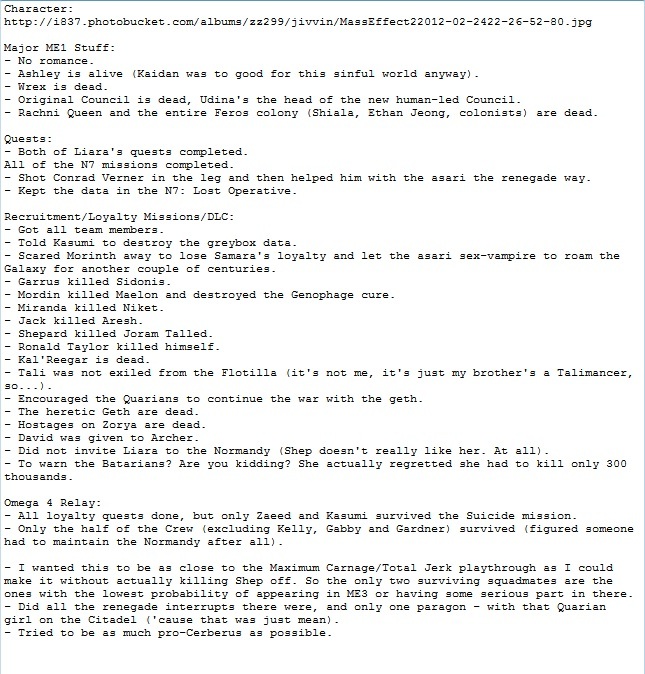 - In the N7: Lost Operative Quest did you keep the data, send it to the alliance or give it to The Illusive Man? - Did you recruit & keep all team members (Including Zaeed and Kasumi)? If not, who was never recruited, or left early? - (Kasumi Loyalty) Did you tell Kasumi to keep the greybox data or was it destroyed? - (Samara Loyalty) Did you kill Morinth or Samara? 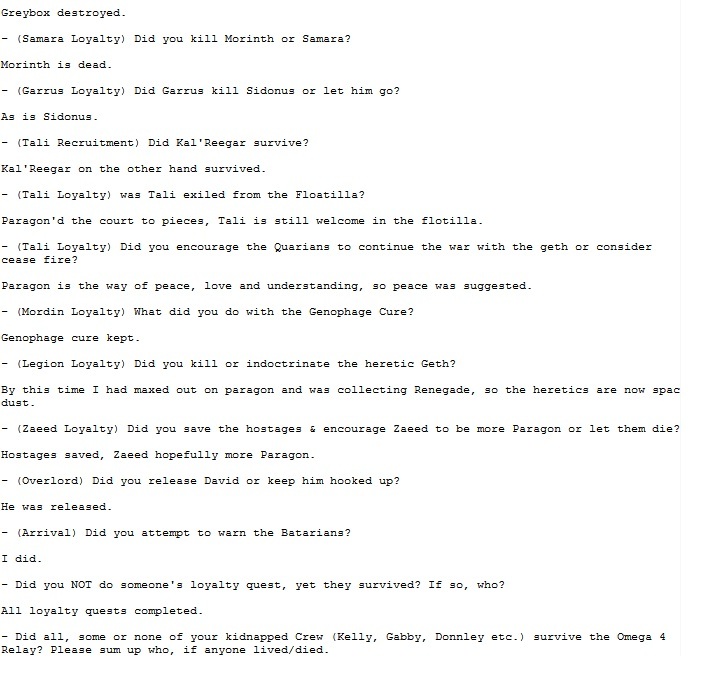 - (Garrus Loyalty) Did Garrus kill Sidonus or let him go? - (Tali Recruitment) Did Kal'Reegar survive? - (Tali Loyalty) was Tali exiled from the Floatilla? - (Tali Loyalty) Did you encourage the Quarians to continue the war with the geth or consider cease fire? - (Mordin Loyalty) What did you do with the Genophage Cure? - (Legion Loyalty) Did you kill or indoctrinate the heretic Geth? - (Zaeed Loyalty) Did you save the hostages & encourage Zaeed to be more Paragon or let them die? - (Overlord) Did you release David or keep him hooked up? - (Arrival) Did you attempt to warn the Batarians? - Did you NOT do someone's loyalty quest, yet they survived? If so, who? - Did all, some or none of your kidnapped Crew (Kelly, Gabby, Donnley etc.) survive the Omega 4 Relay? Please sum up who, if anyone lived/died. * Feel free to add as much more detail as you would like, but anything beyond this point is optional. * If you would like credit, feel free to add a line saying "This save was uploaded by (your online name or whatever you'd like)"
* Feel free to link to a hosted screnshot of your Shepard. If you'd like, you can always email me with one and I'll be happy to host a screenshot for you, I'll edit the link into your Shepard descripton. * If you have anything you'd like me to be aware of, leave a note for me at the very bottom of the text box section. I read every submission myself in full and will see the note. I'll delete the note before approving the submission. * Please remember that I manually approve all submissions. It will probably be a few hours or more until I have time to approve. Please do not re-upload your save if you get the success message after submitting. CLICK HERE to submit your Shepard. Keep this window open so you can use the information above in the text box of the submission page. If your Shepard isn't approved and you did NOT leave an email address, feel free to send me an email, tweet or IM asking why not. If you filled out the text box field correctly but I am not approving your Shepard, and you left an email address, I'll email you to tell you why. I am not emailing people who didn't even try to fill out the text box field correctly anymore. And that's it! Your Shepard should be approved within a day of submitting. Thank you again so very much for taking the time to help out other gamers!